What's up, you guys?! So this week is going to be another sneak peek at a set that comes out this Friday, so let's take a look at some nuns and prophets! [CONT](VC) Limit Break 4 (This ability is active if you have four or more damage):During your turn, if the number of cards in your hand is four or greater, this unit gets [Power]+3000 and "[AUTO](VC):When this unit's attack hits a vanguard, draw a card.". [ACT](VC):[Counter Blast (2)-cards with "Battle Sister" in its card name] If the number of cards in your hand is three or less, draw a card. ...To say that this card applies pressure is a bit of an understatement. Parfait has a solid 11,000 Power with 2 effects that will basically give you a boost in hand size or force your opponent to guard against her. Either way, it means pretty good news to you. If you're hand is 4 or more, then Parfait's Limit Break will work, which will give her a 3,000 boost and the effect to draw a card when she hits the Vanguard. The nice thing about this is that it's a CONT effect meaning that it'll activate the second you get 4+ cards, so it'll go off when you get cards to your hand through a Twin Drive, so it'll throw off any opponent that doesn't know better from her effects. The second effect, which is a bit hefty as far as cost goes as it's an Especial Counterblast 2, only activates when you have 3 or less cards in your hand, but you get to draw a card for it. This makes it so that pulling off her Limit Break becomes a bit easier, and it also helps in the fact that it gives you more cards to call if you need to improve your formation. Overall, I think it's safe to say that people will be taking out their Fromages for this powerhouse of a card. Next Time: After going against this card, I feel like I have a Hex on me. I think...I seem to be way too serious for my own good. Last week was April Fool's week. Boy I feel dumb. But that doesn't matter. That's over now, and we're back to our regularly scheduled reviews. 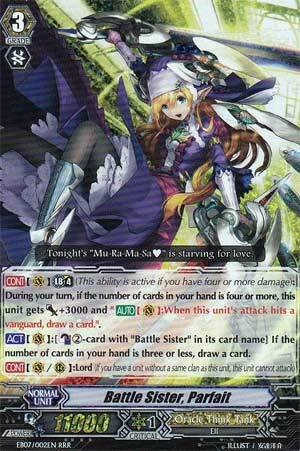 This week it's all about the latest Extra Booster, and starting us off is Battle Sister, Parfait. Her Limit Break skill gives her 3k and lets you draw a card when her attack hits a Vanguard. Oh, and you can CB 2 Battle Sisters to draw a card if your hand is 3 cards or fewer. I think you can easily guess what I'll say about her. It's a Limit Break requiring a hit. It's basically useless. And if you're the kind of idiot who intends to eat damage just to do this, what's the point? You get a random +1. Okay, now that +1 is most likely not staying, you're now on 4 damage and so must guard heavily to avoid a Crit to the face. It doesn't even finish the opponent in a turnaround by gaining a Critical. On a happier note, her other skill is more relevant since once you hit her, you can pretty much commit to a full field and not worry about things getting retired since her skill will get the cards back. I certainly wouldn't go recommending using the newest damage unflipper Lemonade for this though, since she's a poor booster and you should have a full field by then anyway. On the basis that she does nothing to try and actually end the game, I can't really recommend her on the basis she's just trying to do Coco's thing except with more constraints.